- Dr Michael Sutton, Westminster College (Gore Business School), USA. It’s designed to help managers prioritise their KM and culture issues, and brainstorm and plan possible interventions. With the addition of the desktop washable PVC KM Planning Canvas we are now able to offer a comprehensive toolkit to help knowledge managers work through knowledge, information and culture issues and prioritise them with their colleagues in different operational departments. The canvas supports participatory planning on a department by department basis, or for an organisation as a whole. Use a knowledge audit or survey to find out where the important knowledge gaps, risks, and sharing opportunities are. The central zone of the canvas is where you place the most frequently encountered behaviours, using our Organisation Culture Cards. The most frequent signals of Knowledge and Information Management needs are represented using our KM Diagnostic Cards. In a facilitated group session with your stakeholders, ask them to pull down the most important group of issues into the priority discussion zone at the centre of the canvas. 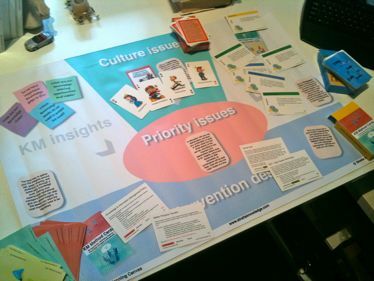 Then when the nature, scope and importance of the issues are fully understood and agreed, work with our KM Method Cards to agree productive interventions to meet the needs. Use our Guidebook to apply some of the techniques and methodologies you have identified. Watch a video on how to use the KM Planning Toolkit!